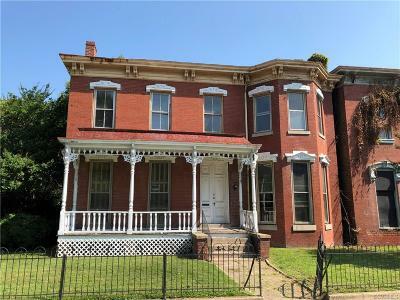 ALL BRICK Circa 1890 home close to Central Park located in the up and coming Petersburg! This AMAZING home with gorgeous architecture, offers a living room, family room, dining room, kitchen, three bedrooms, two full baths, a hidden rear stairwell, heart pine floors, 6 (that's right SIX) fireplaces (one in each main room), huge laundry room that could be converted into a second kitchen, mature trees, iron fence in the front, chain link on side and rear, parking in rear of house. Lots of revitalization going on in the park area, gorgeous neighboring mansions. Less than a mile from Olde Town Petersburg, Ammo Brewing and other restaurants and shops. Per City of Petersburg, zoning permits single family or a duplex (buyer to verify). Fireplaces convey as is, unknown condition. Easy access to Interstate 95 and to Colonial Heights.